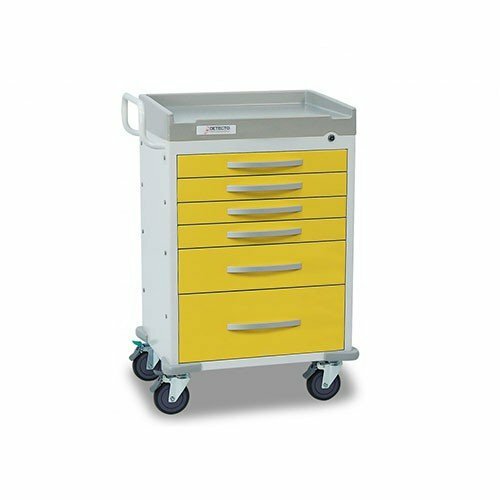 RESCUE Medical Isolation Carts feature keyed or EMG breakaway central locks that are designed to secure all the drawers at the same time for added convenience. The carts' 5-inch-diameter wheels feature two parking locks and one steering lock. ABS bumpers protect all four corners or the medical carts. With its push-handle design, the RESCUE Medical Carts offer a completely user-friendly design. Vitality Medical also carries Detecto's WHISPER Medical Isolation Cart, as well as other storage items, such as the Bergan Smart Storage.